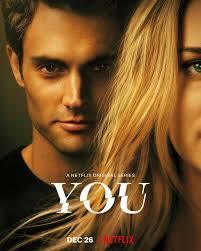 On December 26th 2018, Netflix released their newest original series, You. It originally premiered on Lifetime and didn’t get good ratings. The show stars Gossip Girl actor Penn Badgley and Elizabeth Lail along with Pretty Little Liars star, Shay Mitchell. The story follows a bookstore manager, Joe Goldberg, who becomes obsessed with poet Guinevere Beck. The audience quickly finds out that Joe’s infatuation with Beck is not one out of a romantic comedy but rather out of a horror movie. Joe’s inner thoughts narrate the story as he stalks Beck and tries to control every aspect of her life, while also starting a relationship. After the shows release, people took to Twitter and Instagram to express their excitement for the show along with their disbelief for the insane things that occur throughout it. Maci Sarli(10) shares her opinion on “You” saying, “Whenever I heard about this how I was really interested by it, but some of things that happen in the show make me feel uncomfortable.”. People say that Joe’s actions throughout the show don’t portray him as a sweet lover but rather a dangerous stalker. Although, not all see Joe’s actions as threatening. Many people supported Joe saying that what he did was for love and that to be crazy sometimes is completely normal. Alex Medina(10) says, “ I think that Joe isn’t that bad of a guy. He just really loved Beck and the show was exaggerated, but people are taking his actions way too seriously.”. There’s been a lot of controversy over this opinion, with many saying that the relationship was toxic, and Joe should not be romanticized. He is constantly invading her privacy by looking through her windows, stealing her phone, and getting involved in all of her relationships. Lexi Ernesto(9) explains what she thinks about the show, “ I think the show has it’s areas where they went overboard, but i also think that the show did a really good job of trusting people you don’t know.” she continued “It shows what could if you don’t pay attention or if you’re too trustworthy.” This show definitely makes someone think twice about the people that they are accepting into their lives. After all, Joe Goldbergs are all around us. The series can be found on Netflix, with 1 season and 10 episodes. Watch it today!